We carry Gold reflective tape in a flexible engineer grade. It similar to yellow and reflects about the same color. When viewed together you can see that the two would not be mistaken for each other. The picture below of our 1/2″ reflective tapes shows the two tapes together. The gold is on the far left and the yellow is between the black and white. The bottom of the picture shows the gold when it is reflecting. The gold is at the bottom left underneath the red roll. As you can see gold reflects a bright gold/yellow color. The intensity of the gold reflective is around 78 candelas. This is about 10 candelas less than yellow engineer grade reflective. Gold is the third brightest engineer grade tape after white and yellow. Gold is popular for gate applications. It is bright but still has that elegant look. 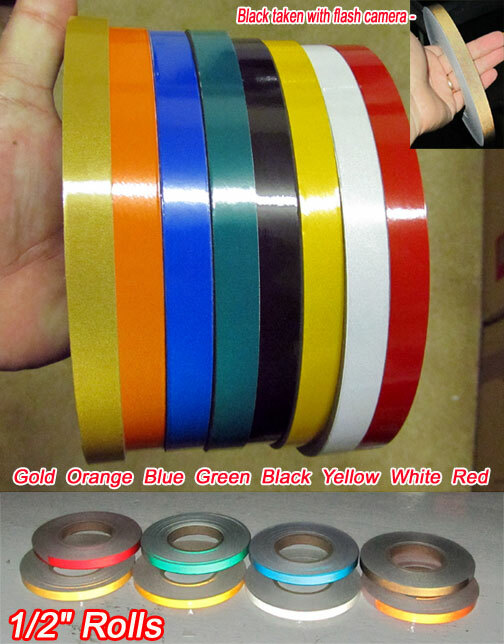 Gold reflective tape can be purchased at the following websites. shop.reflectivestore.com for all sizes including 1/2″ and 8″.